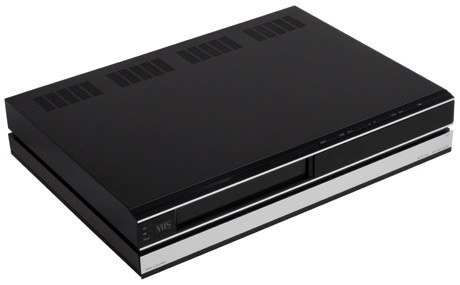 The Beocord VHS 80 replacement, based on the next generation of Hitachi machine. Considerably slimmer and more attractive, this model also featured Dolby HX Pro noise reduction and 3 heads, allowing a “perfect still” function to be added. Alas, the sound was now only mono, but for the televisions it was intended for, such as Beovision 7702, this was not a problem. Direct connections could be made via a Scart AV socket, and there was a 7 pin audio connection. With the optional Datalink panel installed, the audio connection could be used to control the machine as Tape 2 with Beosystem 5000. Text copyright © Beocentral. Unauthorised reproduction prohibited.